I have been inspired by this sea shell wreath from My Romantic Home. How wonderful it would look at my front door. I have so many shells laying around my house from countless beach vacations. Creating this wreath would put them to good use. Has anyone made a wreath before ? I would love to hear your results and any tips to help me along the way. Winner of my vintage tea towel giveaway = Blair from Delight by Design. Congratulations. It looks gorgeous! Perfect for a beach house! Ohhhh, I love shells. I have covered lots of things. On a wreath I would probably just use a glue gun. I have done a chandelier - I'll try to e-mail you a picture! This is beautiful! I might have to try my hand at one too. I can see it as a small wreath, like for a bedroom or bathroom...but also made quite large to hang over the fireplace or as you said, on the front door. That wreath is gorgeous... Well a good glue gun would suffice and one of those sturdy wreath forms u can get in any craft store... You must have a ton of shells... Even if u didn't add as many shells and arranged them sparingly it would still look great w/the ribbon intertwining.. I haven't made a wreath, but I have done a lot of other shell projects. On one of my blog posts, I show how to do lamps. For that I used joint compound (drywall mud) mixed half and half with sand to first coat the surface to be covered, then "butter" the back of shell and build your design. This gives a very beachy look and sticks well. I have done other projects, like covering a mirror frame or box, using simple white Elmer's craft glue because it dries clear. A hot glue gun doesn't give very good results because the shells come off very easily. If this is going to be directly exposed to the elements, I would recommend e-6000 or some kind of epoxy glue. I have found some helpful suggestions on websites on shell art and sites selling shells in bulk, wholesale. That wreath is great... love it! My only piece of advice when creating a wreath is that (for me at least) I always seem to need more supplies than originally thought. Now I always get more supplies than I think I will need and return what I don't end up using - but I normally end up using it all! good luck! that is a gorgeous one. I have contemplated making one myself but eek! I get overwhelmed ! good luck with the project and I am sure your readers would love to see the finished result. I love this wreath. I have a couple of shop bought ones but no where near as pretty. 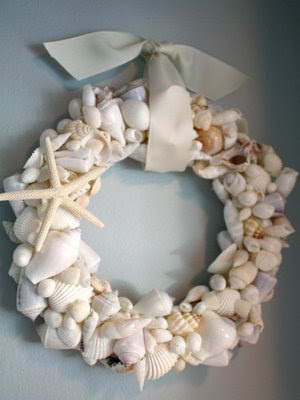 I know, I have seen so many wonderful shell wreaths around, but have not tried to make one myself yet. Believe it or not, I do not have enough shells to make one, not even close. Maybe after the summer. So not tips, sorry, but I wish you good luck with the project! Oh, it is so beautiful! I have never made one but would love to try! I'm always eyeing shell wreaths, but I've never attempted to make won. My daughter and I made a shell box together. We had fun with it. I have yet to make a wreath myself but, would love to make on up of both succulents and shells. Love the wreath...what a great way to display a shell collection, sounds like Scribbler gave you useful information. Thanks for your comment...I cracked up at the 5'oclock somewhere...so true! I absolutely adore that wreath! I make sea shell wreaths. Use a hot glue gun and have fun. One thing that makes them look elegant is to layer them. Hi! 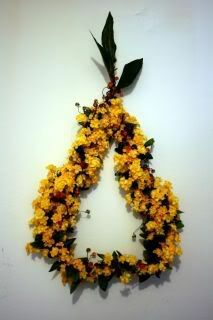 I'm a very new follower, but I wanted to say that I adore this wreath so very much. I live by the water and am currently hunting for my very own bungalow! I would have this year round. I am SO making this for my Mom!!!! She'll love it! ThX for sharing! I make these all the time because I live only 4 miles from the beach and cannot seem to leave the shells in the sand! I tried a glues gun at first, but some shells came away and I burnt my fingertips too many times. ow I use a straw wreathe form and a tube of a clear craft glue called GOOP. It is a bit smelly, so I do my wreathes outside on the patio table. This glue has a bit more stretch to it when dry, so I find it holds better. Also, was the shells before you begin and let them dry, to get rid of the sand and any odor they may carry. I love these wreathes, have sold a few and made several as gifts. Runs in the Blood ? "Do you want this old clock ?"